Past Schools and University Projects - Jacaranda, Inc.
For more than three decades, Jacaranda has crafted real wood products from more than 100 domestic, exotic and rare species. The quality of SanFoot veneer wallcoverings is unparalleled while its diverse selection of options and architectural panels can help your school create your desired environment. We have numerous products and options that can enhance your facility’s appearance. You can choose from a wide range of species from ash to zebrawood without negatively affecting the environment or your budget. 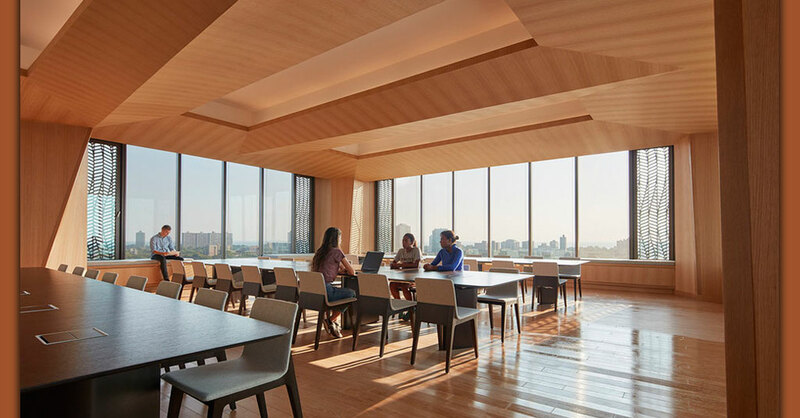 Our stunning veneers can also be found in Alice Tully Hall, Brazo Performing Arts Center, Central Washington University, Denver Performing Arts Center, Miami Performing Arts Center and Chandler Performing Arts Center as well as schools throughout the world. Not only is our veneer popular but also versatile and able to be used for wallcoverings, reception counters, ceilings, columns, architectural panels, doors, millwork and lighting accents. SanFoot veneer is made using real wood cut into incredibly thin sheets. It is then fused with backing materials that enable its application on flat or curved walls. Architectural panels are available with a variety of substrates and finishes and are designed to integrate beautifully with veneer wallcoverings or millwork for a turnkey design solution. TransTec is another option that is popular with educational facilities. This natural wood veneer is so thin that light can pass right through it. Its translucence virtually glows, making it ideal for use in light fixtures, panels or entire walls. TransTec comes to life with a luminous glow when backlit and can be combined with special details, designs, patterns or lighting alternatives for a beautifully unique feature. FineTec is reconstructed real wood designed to simulate the look of rare figures and designs made from readily available species. Every real wood product that we offer is fully customizable to meet the needs of your educational facility. Our scientists can craft your desired custom stains, and you can choose from hundreds of unique stains and finishes. We can even add an extra durable layer to buffer against damage in high-traffic areas, such as hallways or elevators. We have strict guidelines with respect to the environment. We only use sustainably harvested real wood and have incorporated patented manufacturing techniques that maximize the yield of each log while minimizing waste. Contact Jacaranda today to find out more about our real wood veneer or to schedule a consultation with our specialists.